Staffordshire Moorlands District Council wants to move the Leek outdoor market from Market Place to nearby pedestrianised Derby Street. Shop owner Roger Warrilow, who started a petition against the plans, said: "If Leek market dies, Leek dies with it." However, council said moving the market will increase footfall in the town. Councillor Edwin Wain said: "The move would create around 65 car parking spaces and we believe the market and the shops will bounce off each other. "We have to move forward - the market has gone down to 20 or 25 stallholders in recent years so we have to do something to help them." Earlier this year, a report showed 20 regular traders used the 76 stalls available on the site for the outdoor market, which was losing the council £60,000 a year. Mr Warrilow said: "Why should it be any different down Derby Street than in the Market Place? 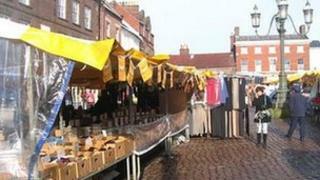 "We're renowned for being an ancient market town and the market is a fantastic opportunity to start up new businesses." However, Councillor Barry Cowie, of Leek Town Council, also disagrees with the plans. He said: "Personally, I'm against the market move, it's been there for 800 odd years and the market square should remain a market square. "Moving it onto the main high street will be a real inconvenience for the existing retailers and I'm quite concerned it's going to cause traffic problems which would discourage shoppers. "It would also reduce the size of the market further - for example the meat van that comes on a Wednesday wouldn't be able to park up on Derby Street."